What we do! On a normal night! The first thing your guests will see as they arrive is “The Security Guards” – “Steve Jones and Norman Bush”. With a strict policy of “No Weapons” and “Strictly No Guns” your guests will have to pass though our metal detector. With searches and body planting, your night is guaranteed to start with a laugh and a great way to put a spanner in the works. Our security guards will continue with the service as they show our guests to their seats with a seven million candle powered lamp. We now offer even more, including Tony and Mike – Lounge singers. A non-musical trio that has a band member missing. Can the audience help? This will get your guest in the mood for a party! 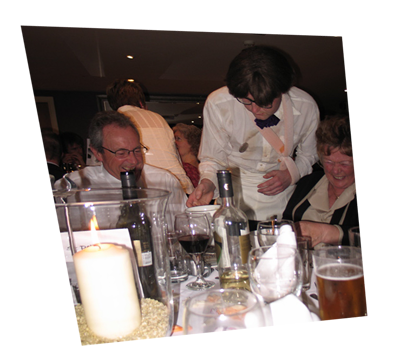 We pride ourselves on the fact that this is purely light entertainment and that none of your guests will be upset. We know when to stop! If you want a Mix and Mingle/Meet and Greet to start your evening with a spot of comedy that people will remember, then book us!